Looking to temporarily disable your Instagram account? Instagram is truly one of the most powerful social media platforms of this era, and it can be viewed as the most significant platform that has evolved this decade. Instagram is an amazing social media platform in so many ways, and clearly, people seem to find that it brings value to their lives considering the fact that more than 800 million people are actively using it. But social media just isn’t everyone’s cup of tea. Therefore, you’ve maybe made the decision to deactivate Instagram. Maybe have found that Instagram has been taking up too much of your time, maybe you have no interest in opening up your life for the world to see and share posts about your life. You might have created a new account and now, you want to disable your old Instagram account and prevent anyone from seeing it, but still save all your posts and data which is tied to your account. Do note that when you disable your Instagram account, you temporarily disable it, and I’ll go more into detail of what this actually means further on. If you want to take a break from Instagram, you can temporarily deactivate your Instagram account (or deactivate Instagram, which some people also call it). In this guide, I’ll take you through the process to disable your Instagram account step-by-step. Disabling your Instagram account is simple and only demands a few steps. Do note that you can only temporarily deactivate your Instagram account through your browser – not inside the Instagram app. 1.Log in with the account you want to deactivate on instagram.com via a mobile browser or on a computer. You can not disable your account temporarily via the Instagram app. 2. Click on the ”profile symbol” at the top right of your screen. 4. Fill in the reason to why you are temporarily disabling your Instagram account. Note that you have to do this to be able to complete the process. How many times can you temporarily disable Instagram? At the moment, there are no restrictions on how many times you can temporarily deactivate your Instagram account. However, you should be a bit careful as doing it too much can send signals to Instagram about spam, resulting in Instagram seeing you as a threat, locking your IP. What happens when you temporarily disable Instagram account? If you disable your Instagram account temporarily, your account and your photos, comments, and likes will become hidden. They will, however, not be removed. Once you reactivate your account again, all data will be available and visible again. What this means is that when you disable your Instagram account, no-one will be able t find your account nor any data connected to it (such as comments and likes you’ve left). 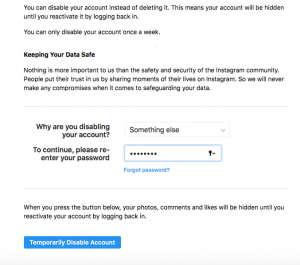 Temporarily disable Instagram account or permanently delete it? There is a difference between temporarily deactivating your Instagram account and permanently deleting it. But when you temporarily disable your Instagram account, you have a solution of hiding your account for the public, yet still have the ability to access all of your content and data tied to it, as well as be able to reactivate it. If you aren’t 100% sure that you will never ever be needing the account again or may want to take a look at your old posts sometime in the future, temporarily deactivating it really is the best alternative. This is because if you permanently delete it, there’s no turning back, no matter what you do. If you do not want to disable the account temporarily but want to change who can see it, you can specify that your posts should be private or block certain people. You can do this by either blocking specific accounts or making your Instagram account private. Remember that if you make your account private, YOU are the one who decides who gets to follow your account. People request to follow you, and then you decide whether you allow them or not. If you have temporarily disabled your Instagram account but now have changed your mind, you can reactivate it and get it back to the way it was just before you disabled it, you can do so effortlessly? Log in to your account! It really is that simple! How many times can you deactivate your Instagram? You can only disable your Instagram account once a week. This means that if you have disabled your account, it is not possible to disable it again until after a week. As an example, if you deactivated your account on Monday and then reactivated it on Tuesday by logging in, it cannot be deactivated again until Monday – a week after it was deactivated. 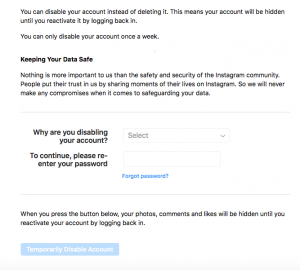 If you temporary disable your Instagram account, the data of your account is stored in Instagram’s database. This means that when you log in to your account again (and reactivate your account), the data will be restored. When you disable your Instagram account, it will, therefore, be sort of abeyant. This also means that when you disable your Instagram account, your account will be nowhere to be found, whether in people’s followings or the accounts they follow. As such, since they can’t find your account, they won’t be able to unfollow you. Also, as a result of you deactivating your account, the people who are following you will both (at least by the looks of it) get one less follower (if you followed them), and follow one account less (if they followed you). A reason can, however, not unfollow you during the time your Instagram account is disabled. How long can you temporarily disable your Instagram? Many people are afraid that if they disable their Instagram account and leave it disabled for a long time, Instagram might eventually delete the account permanently, but there is no evidence of this. Instagram doesn’t say how long you can leave your Instagram account disabled for, however, you can assume that you can leave it indefinitely and then come back to it. According to Instagram themselves, your account will sit dormant until you log in next time. I hope you found this guide on how to disable your Instagram helpful. If you have any questions, don’t hesitate to ask them below and I’ll answer them! When I suddenly don’t find a message from this person in the chat room, what are the possibilities? The person deleted his account, blocked me, or disable the account? Or all possible? Yes, is answer to your question. Instagram is a social media platform and DM’s on Instagram is not treated separately as it is done on Facebook and Facebook Messenger. When a user deletes their account, everything connected to the account (including direct messages will be deleted. When it comes to blocking, if you have been blocked, you should be able to view all previous DMs sent to that account. If the account is disabled, the dms should disappear. but then mention that previous DMS sent to the person who disabled his/her account is visible? I am wondering if a disabled account which is private is visible when we google search. Thanks! When someone searches for your Instagram username, your profile will show up even if your account is private. I was just wondering how long before you can deactivate after already doing so and reactivating it within a short time period. For example if I deactivated my about a month ago then want to reactivate it today, can i then deactivate it again the same day in a few hours or do i have to wait a week before being able to deactivate it? I was just wondering how long before you can deactivate an account again after already doing so, and the process of reactivating it within a short time period. For example if I deactivated my account about a month ago, then want to reactivate it today, can i then deactivate it again in a few hours on that same day? Or do i have to wait another week before being able to deactivate it again? If you have deactivated your Instagram account, you can reactivate it directly by simply logging in. However, if you’ve deactivated and reactivated it, you need to wait one week until you can deactivate it again. hi, i was just wondering if i disable my instagram, am i still able to scroll on my explore page and home page? If you disable your Instagram, you won’t be able to be logged in to your account, so, no, you won’t be able to do that. When you disable your Instagram account and then log in to your account, it will no longer be disabled. I’ve disabled my account. But my friends still have access to my profile. How? It’s supposed to be hidden until I reactivate it right? Yes, your account is supposed to be hidden, but if you recently deactivated your account, it may still be visible for a short period of time until the disabling has gone through.